Save an extra CDN$ 17.33 (40%). Buy the Kindle Edition instead. Comment: No dust cover.Minimal signs of wear. Ships direct from Amazon! Because nature is so expansive and complex, so varied in its range of light, landscape painters often have to look further and more deeply to find form and structure, value patterns, and an organized arrangement of shapes. In Landscape Painting, Mitchell Albala shares his concepts and practices for translating nature's grandeur, complexity, and color dynamics into convincing representations of space and light. Concise, practical, and inspirational, Landscape Painting focuses on the greatest challenges for the landscape artist, such as: • Simplification and Massing: Learn to reduce nature's complexity by looking beneath the surface of a subject to discover the form's basic masses and shapes.• Color and Light: Explore color theory as it specifically applies to the landscape, and learn the various strategies painters use to capture the illusion of natural light.• Selection and Composition: Learn to select wisely from nature's vast panorama. Albala shows you the essential cues to look for and how to find the most promising subject from a world of possibilities. The lessons in Landscape Painting—based on observation rather than imitation and applicable to both plein air and studio practice—are accompanied by painting examples, demonstrations, photographs, and diagrams. Illustrations draw from the work of more than 40 contemporary artists and such masters of landscape painting as John Constable, Sanford Gifford, and Claude Monet. Based on Albala's 25 years of experience and the proven methods taught at his successful plein air workshops, this in-depth guide to all aspects of landscape painting is a must-have for anyone getting started in the genre, as well as more experienced practitioners who want to hone their skills or learn new perspectives. Start reading Landscape Painting on your Kindle in under a minute. Loved this book! I have read lots of books on painting. A lot of them focus on the writer' own style but here there are many reproductions from many other artists. Albala's book is the product of an intelligent and experienced artist and teacher. Albala shares his knowledge on many ways to improve your technique, dealing with colour, values, simplification, composition, and working from photographs. . Because of the many helpful tips, I would recommend it highly to anyone interested in painting landscapes. Great read, fantastic art work ( thank you for the introduction to some great artists ), and a lot of food for thought. Highly recommended for all levels and those curious to find out how it`s done. Mitchell Albala`s teaching experience shows and he doesn`t waste your time with product recommendations, self promotion, or repeating material you come across in too many other books. This is new, it is fresh, and it is truly helpful in so many ways. Loved this book! I love landscapes, and yet have never been able to paint them to my own satisfaction. Albala shares his knowledge on many ways to improve your technique, dealing with colour, values, simplification (this is always a major issue with landscapes! ), composition, working from photographs, even how to sign a painting, etc. It has many illustrations and gorgeous reproductions from many artists besides himself. Full of helpful tips on many subjects. I would recommend it highly to anyone interested in painting landscapes. 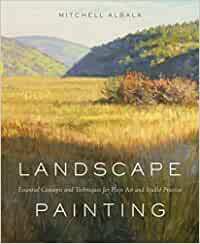 This is the most helpful book about painting landscape I have come across. Well written, well illustrated, content very clear and easy to understand, especially for a french speaking person like me. Mitch's approach is a little off of my own, but never the less still helpful. Getting too caught up in trying to capture the bigness of things has been a problem for me. Mitch is good at showing how to isolate a dramatic element out of the bigness to give your paintings more impact. 4.0 out of 5 starsA very informative book even for experienced artists. I chose this book searching for specific information that would help me further my Plein Air expertise. It requires careful study, even note taking to gain the full benefit from a book packed full of helpful information. I discovered new insights that have proven helpful. I would recommend this book to anyone specifically interested in painting on site. Very informative and a plethora of examples! excellent book! helpful n every way.